I've had hard drives fail on me before without any advance warning and lost all of my irreplaceable data. That's why I backup all of my information now onto external media and make sure to check the status of my hard drive once a week. 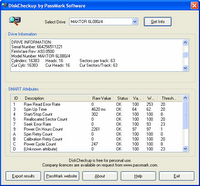 DiskCheckup can help you check the SMART attributes of your hard drive and is a free for personal use. The SMART attributes are built into the hard drive and can help you assess mechanical damage or read and write errors. If the status of any of the attributes you see is not "OK", it might be time to backup your files and get a new hard drive pronto.